L eesa White lay in bed at night thinking about remodeling her master bathroom. She considered using mosaic tile, painting her cabinets a lighter color and getting rid of her bathtub. Less brown, more blue. In the end, she did none of that. 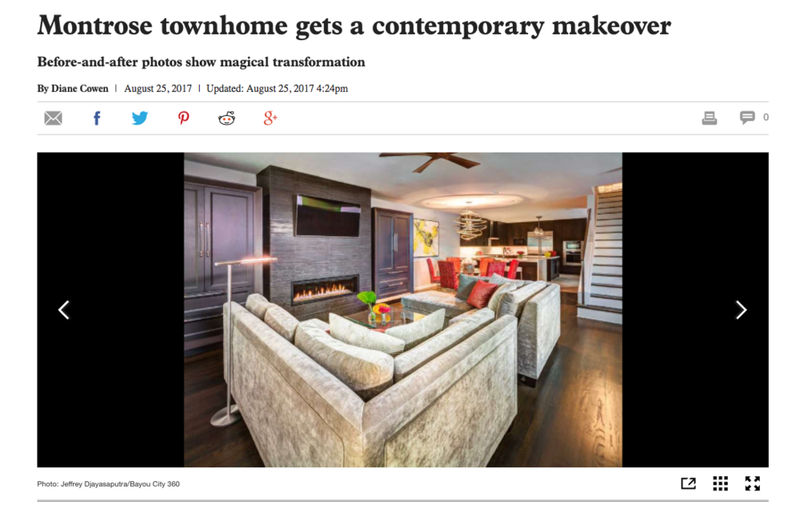 White and her husband, Lloyd, had bought their Montrose townhome in 1998, a spec home in its earliest stages of construction. They finished it out the way they wanted and, in the years since, they filled it with treasures collected on their travels all over the world. Lloyd died in 2001, and now Leesa has retired from a career in corporate law - she worked at KBR, Enron and EOG. Her needs have changed since they bought the townhome. Through Angie's List, she found interior designer Missy Stewart of Missy Stewart Designs to help. Certain she already knew what she wanted, she expected to pay Stewart for two hours of time, confirming selections and colors. Four years later, the two women have just finished work on nearly the entire 3,200-square-foot, three-story home. White's ideas were more of an update; Stewart persuaded her to do much more. With remodeling work from Leslie King's Greymark Construction, there's now Carrara marble in her shower, counters and around the tub, and cabinets that are even darker - espresso, a brown so dark it almost looks black. A huge mirror rests in a fancy frame made of the same marble, and a pretty basketweave-style tile covers the floor. White-and-silver wallpaper brightens it even more. All finished, White stood back and admired her new space. "When the bathroom was done, I said to Missy, 'Now let's do the kitchen.' And Missy, what did you say then?" Stewart finished the story: "I said, 'You cannot walk from this bedroom into that bathroom. We need to do your bedroom next.' It was very dated, and she has this gorgeous new bathroom." White had dubbed her bedroom the "Africa" room. Elsewhere there was an Asia room and an Italy room. Her kitchen had an apple theme. "You can't believe how many animals I had. I had stuffed animals, wood animals, metal animals, leather animals. I had animals everywhere," White said. "My bedding had little monkeys on it, and I had a 6-foot stuffed snake wound around the stair rail. I had zebras; I had giraffes. I had a lot of monkeys and an African chair and masks on the wall." The bedroom got a clean sweep. Her traditional furniture was replaced with updated things: a new bed and nightstands, a tall dresser and a pair of acrylic lamps. Floral art and two long mirrors decorate one big wall, and soft, gauzy curtains span the two windows and door on the back wall of the room. The monkey bedspread is gone, too, replaced by subtle gray-and-white bedding. A single bronze lion stands guard near a fuchsia upholstered chair. "When it was done, I had this master suite that was so beautiful and so calming - not cluttered," White said. "The bug had bit me, and that was it." She returned to her idea of remodeling the kitchen, but Stewart offered yet another reality check: "You might want to think about the rest of the downstairs." White wasn't exaggerating about the clutter in her bedroom, and her main floor was just as full. White loves to shop, and the evidence was everywhere. Containers of faux flowers were scattered about; every surface - kitchen counters, cabinet tops, dining table, piano top and coffee table - were covered with all sorts of things. There were even baskets of things under her side tables. "Let's just do the whole house," White declared. For months, she lived in her upstairs and ate in restaurants while her kitchen was gutted and reinvented and her furniture replaced. When White was anxious about getting rid of perfectly good furniture, Stewart urged her to donate to charities such as The Woman's Home, where it could be sold. Every piece would get a new life and a new home. The grand piano stayed and now has a beautiful harp positioned next to it. In the kitchen, a partial wall of cabinets that separated the kitchen from the dining area was knocked out for an open layout. White squares of tile were replaced with tile that has a wood-grain look. Sheets of white-gray quartz cover the island, counters and backsplash, set against dark-brown cabinets. Her 5-year-old stainless-steel appliances left, too, replaced by Wolf Subzero beauties that have given White a new hobby: cooking. She's signed up for all kinds of classes at Sur la Table and has gotten lessons from Wolf on using her steam oven. Wood floors in the living room were stained a darker color. Mismatched furniture - including an armchair covered in camels and elephants - that once sat on a dark and dated rug was replaced with beautiful gray velvet L-shaped sofas that face one another with a sophisticated acrylic coffee table in the center. Built-in cabinets were removed, and now two custom-made armoires flank a tile-covered fireplace. "We solved problems through design," Stewart said of the armoires. "Leesa did not have a front closet and had things in her entryway that you would have in a closet. She has all of that put away, and it looks very sophisticated." The dining area in the center of the space is as modern as they come. An architectural acrylic table with a glass top is surrounded by red upholstered chairs with acrylic legs. The theme is repeated nearby in kitchen space that's been turned into a desk - a thin swath of glass that floats on risers between two sets of cabinets. Tucked underneath are two acrylic barstools with seat cushions in the same red fabric. A bright-yellow painting serves as a backdrop to the dining table, a tribute to White's affection for tennis. She plays in a women's league, and she also is a huge fan of Roger Federer. Streaks of canary yellow in the painting represent the swoosh of the tennis ball flying through the air. What appears to be a splotch of black paint near the center is actually Federer's face in profile, a little secret that White loves. Still underway is a renovation of her landscaping. A small plot in front will create a parking space for a visitor, and a new privacy gate will replace the wrought-iron one. In back, her small patio will become an oasis for entertaining. "I used to entertain more, but I've been in the midst of remodeling for four years," she said. "I go to happy hour with my girlfriends every Friday night. When my backyard is done, I'm going to have a standing happy hour." Her new, clutter-free home has liberated her life. In addition to cooking and tennis, she's taken up playing the harp. There's another new habit, too: showing off photos of her home and bragging on the talents of her new friend, Stewart. "I love it when people say, 'Oh, it looks like it's from a magazine.' "